'We ourselves fix boundaries to the sanctuaries and precincts of the gods, so that nobody may cross them unless he be pure; and when we enter we sprinkle ourselves, not as defiling ourselves thereby, but to wash away any pollution we may already have contracted . 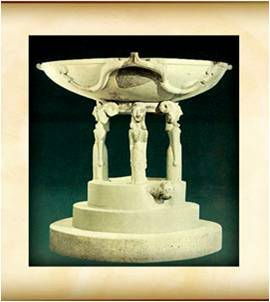 '3 There is abundant evidence from literature, vase paintings, and excavation for these stoups of lustral water sited at the entrance to sanctuaries, for the purification of those who entered. In inventories, they appear as part of a temple's normal furnishing; Hero, in his Pneumatica, tells of a mechanical device that gave forth lustral water at the drop of a coin.4 It is very revealing for Greek conceptions of the sacred that in Athens the agora, civic and political centre of the city, was marked off by similar lustral stoups. 3 Hippoc. Morb. Sacr. 148.55 ff. J., 1.46 G.
4 Cf. SIG3 index s.v. περιρραντήριον; Hero, Spir. 21. Full treatment by Ginouvès, 229-310 (my debt to this learned and comprehensive work is very large). For the earliest perirrhanteria see J. Ducat, BCH 88 (1964), 577-606. On their function cf. Lucian, Sacr. 13, Pollux 1.8.
αὐτοί τε ὅρους τοῖσι θεοῖσι τῶν ἱερῶν καὶ τῶν τεμενέων ἀποδείκνυμεν, ὡς ἂν μηδεὶς ὑπερβαίνῃ ἢν μὴ ἁγνεύῃ, ἐσιόντες τε ἡμεῖς περιρραινόμεθα οὐχ ὡς μιαινόμενοι, ἀλλ᾿ εἴ τι καὶ πρότερον ἔχομεν μύσος, τοῦτο ἀφαγνιούμενοι.